Russian officials have raided the offices of the world's largest aluminium producer, Rusal, amid an investigation into alleged tax evasion. The Moscow branch of Russia's Investigative Committee is looking into claims a Rusal subsidiary dodged more than $6m (£4m) in taxes. Subsidiary boss Igor Kasyanov could face a six-year jail term if convicted. Rusal, controlled by one of Russia's richest men, Oleg Deripaska, dismissed the allegations as "groundless". Mr Kasyanov heads Rusal Folga (Rusal Foil), and is accused of doctoring accounts from 2008 to 2009 to include services rendered by a non-existent company. The raid saw the central Moscow building closed off and special forces soldiers stationed at reception, Russian news agency RIA Novosti reported. "Items and documents [obtained as a] result of the searches... will be made part of the material of the criminal probe," the Investigative Committee's Moscow branch said in a statement. 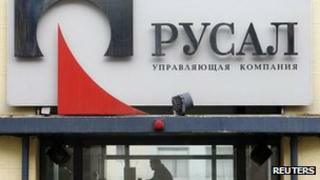 Rusal was quick to deny any wrongdoing by its subsidiary. "The actions of the law enforcement agencies... are related to groundless tax claims made by the Tax Office and Investigation Department of the Moscow Investigative Committee against Rusal Foil, a subsidiary of Rusal," the company said in a statement. Rusal said it planned to appeal against the tax claim, which was issued by a Moscow court but has not yet come into effect. Mr Deripaska was once the richest man in Russia and is now reported to be the country's 14th-wealthiest individual.